The Wild Apricot app for members requires Android version 5.1 or later. 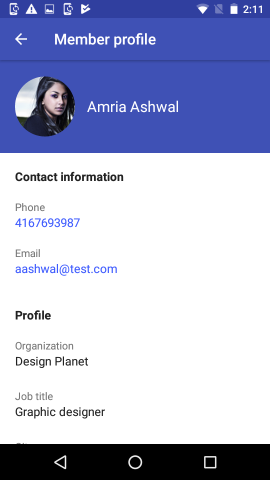 Wild Apricot's member app is a single app that different associations can use for their members. To download the Wild Apricot member app for Android, tap here. Members can log out of the app from the main menu. 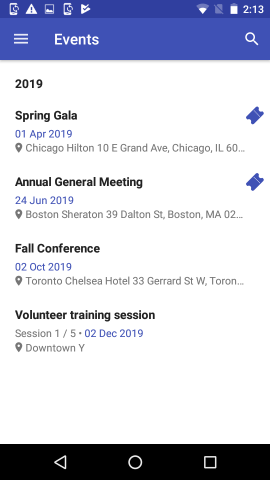 Depending on your settings, the Wild Apricot member app can consist of the following modules: Profile, Members, Events, Tickets. 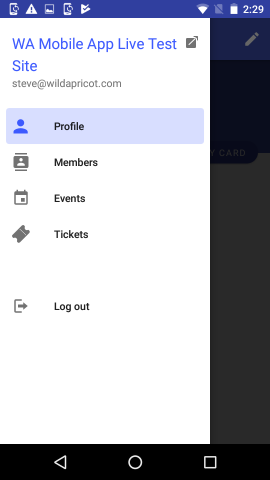 When members first log in to the app, they are taken to the Profile module. 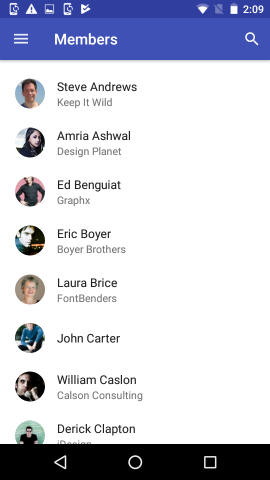 To jump to another module, swipe from the left and tap the module name from the menu that appears. To log out of the member app, members tap Log out. Members can view their member profile by tapping Profile from the main menu. 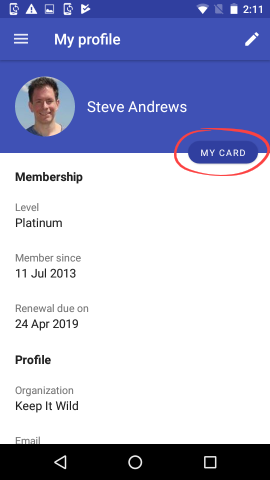 From their member profile, members can view their membership card by tapping My card. Unless you have disabled it within your mobile app settings, members can view your member directory by tapping Members from the main menu. To send an email message to the member, tap the member's email address. 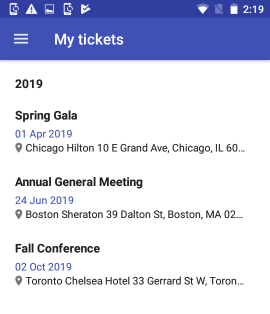 Unless you have disabled it within your mobile app settings, members can view an event calendar showing upcoming events by tapping Events within the main menu. 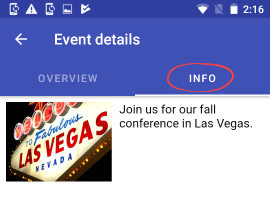 A ticket icon will appear beside events for which the member is already registered. 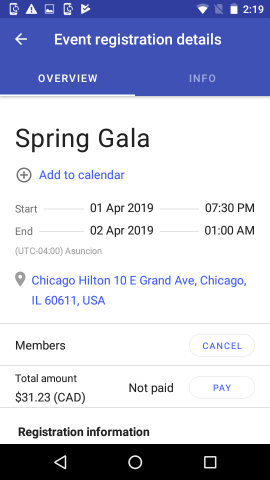 To add the event to their calendar app, the member taps Add to calendar. They'll be asked for permission to access their calendar. Tapping on the location within the event details will display the location within their map app. To view the event description, the member taps the Info tab. 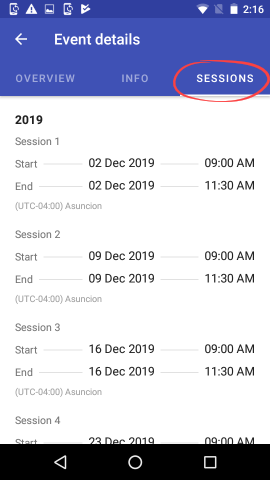 If the event has multiple sessions, the member can tap the Sessions tab to view session details. Members can register for the event by tapping the Register button beside the appropriate registration type. 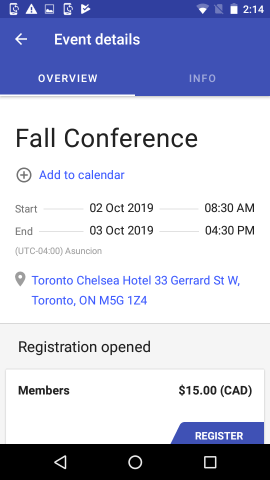 The registration form will appear, along with options to specify the number of guests and indicate whether the registrant wants to appear within the public list of event registrants. Registrants cannot register using a registration type that requires a registration code. 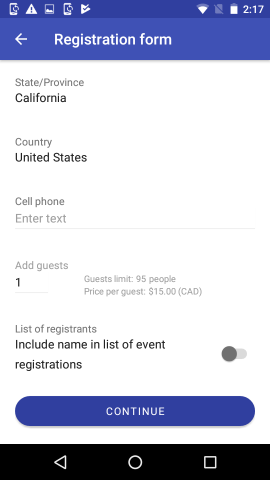 Registrants cannot specify the number of guests if the registration type was set up to collect contact information or full registration information. Once they click a payment option and complete the registration, their registration will appear within their Tickets module. 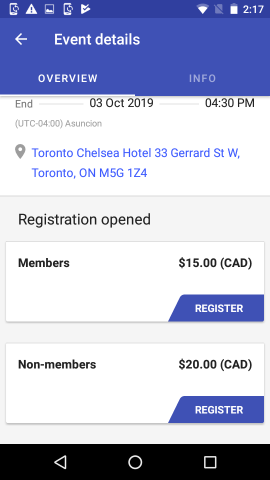 Members cannot use this app to join a waitlist for an event. 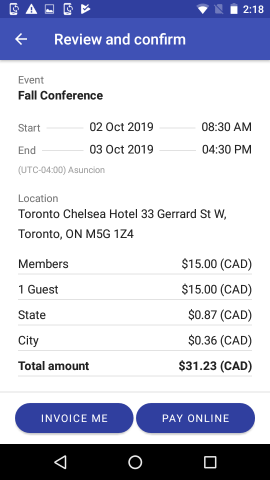 Members can view their existing event registrations by tapping Tickets within the main menu. 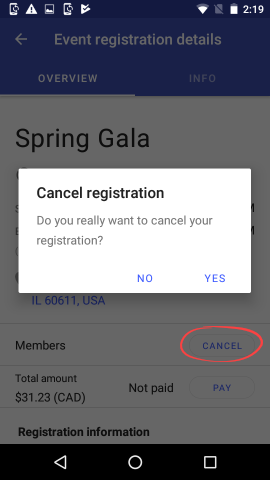 To cancel an event registration, a member clicks the Cancel button within the event details. They'll be asked to confirm their request to cancel the event registration. 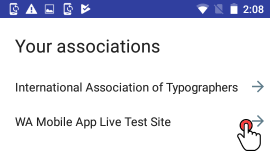 For instructions on using the Android version of the member app, click here. You might want to share this page with your members, since Wild Apricot provides support to site administrators, but not to your members.